The jinx has been lifted! Murphy and his Law have retreated! We have ignition. Trajectory nominal. Oh wait – we aren’t in space, are we? And I bet you are curious to know what the heck I’m talking about, right? Riiiiiiiiiight. Our house in PA finally sold, finally closed, done done done! Now we can rest easy not having to worry about property 3000 miles away. Murphy and his Law can go bother someone else for a while. Aren’t those pretty? 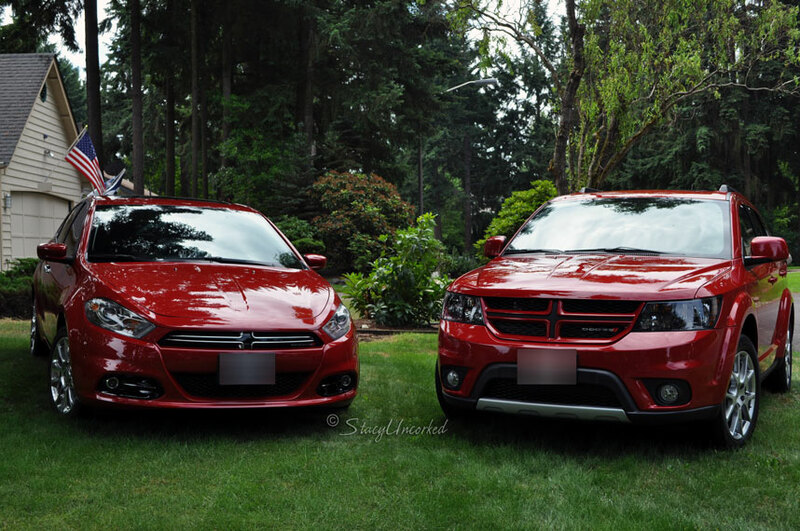 His is the Dodge Dart, mine is the Dodge Journey. Since his BMW and my Hyundai Santa Fe were from 2009 and been utilized in several cross-country road trips (not to mention all the pesky driving the kids to school and back), we figured this was the prime opportunity to give ourselves an upgrade so we won’t have to worry about our vehicles ultimately nickle-and-dime-ing us to death in the near future. There were already a few issues that were luckily covered under warranty, but the warranty on both vehicles had expired, so you know Murphy and his Law would be waiting in the wings. We’d prefer to thwart good ol’ Murphy whenever possible. The thing I’m most enamored by (besides the fact the Journey handles better than the Santa Fe and gets better gas mileage) is the technology. Both vehicles have the coolest technology. We did a lot of comparisons online for various makes and models, and these stood out overall with performance, reliability, gas consumption and of course technology. It’s almost too bad I won’t be spending as much time in my vehicle like I was – I might have to find excuses to drive places just to enjoy it thoroughly. Ahem. She truly is a sweetheart – lovable and obeys basic commands, so that’s been a relief. The only thing she hasn’t gotten used to yet, is the cats. She is obsessed with wanting to play with the cats, but of course the cats want nothing to do with her. It’s like she has OCD when it comes to Blackspot in particular – we wonder if because dog eyesight is so bad, the fact that he’s all white except for his black toupee, that maybe all she sees is that black toupee and eyeballs. Maybe the floating toupee and eyeballs is a little unsettling, hence her propensity to stand for incomprehensible amounts of time staring down the cat while the cat wisely perches at the highest level on top of my corner curio cabinet, well out of reach from any annoyances. Though we get annoyed at the constant wining and barking when Lila is focused on her cat mission. Hopefully the excitement (for her) will wear off soon. When the cat has ventured off his perch and tried to sneak past through the living room, we’ve gotten some great laughter watching Lila try to chase the cat through the living room – she’s not used to the hardwood floors, so she tends to run in place as she tries to gain traction to no avail. Funniest. Sight. Ever. We’re going to have to video tape that action and share the laughter. Stay tuned. 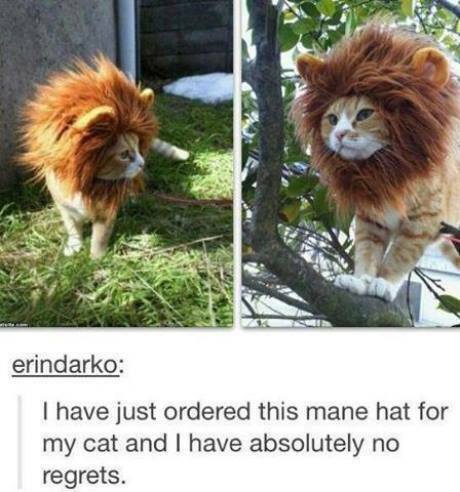 I found the cat manes on eBay, so you know I’m going to have to order one for each cat. It’s a must. Stay tuned for that. Speaking of being a ‘must’… Now that our house is finally sold in PA and we aren’t paying bills on two properties, we can finally focus on the priorities we have with our new house – first on the list is central air. It was on my ‘gotta have’ list when we were looking for houses, but we compromised with this house not having it, since we loved the house. Since the newer furnace and everything is already all set up to accommodate central air. We’ve certainly been wishing we had it already, since the weather has been gorgeous but hot – sleeping in a hot bedroom is not my cup of tea. You know, that kind of hot. This Friday is the day, we’ll be getting central air installed and finally be able to have a good night’s sleep – so glad it’s happening sooner rather than later, because the hottest part of the year hasn’t even arrived yet. We’ll be ready when that day comes. We’re also plotting and planning our addition so I’ll have a wine room and the hubby will have a music studio – we’re leaning towards the idea my friend Michele had in simply getting a giant shed, since that would serve the purpose and be less expensive overall from permits to final construction. It will be nice to get back into the winemaking mode again! 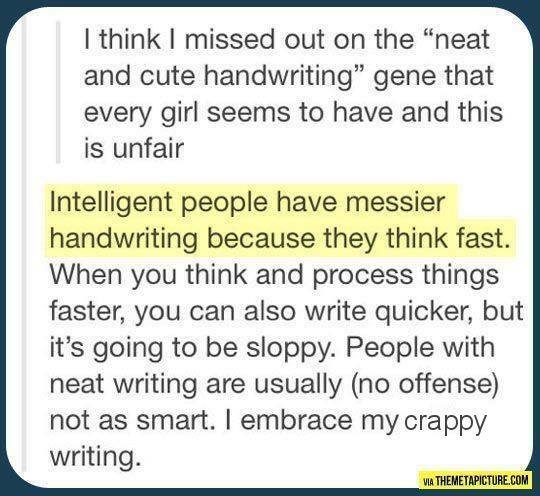 That’s basically what I do – think and write too fast, hence the sloppy handwriting. Thank goodness it’s just a sign of intelligence level. I can live with that. Heh. 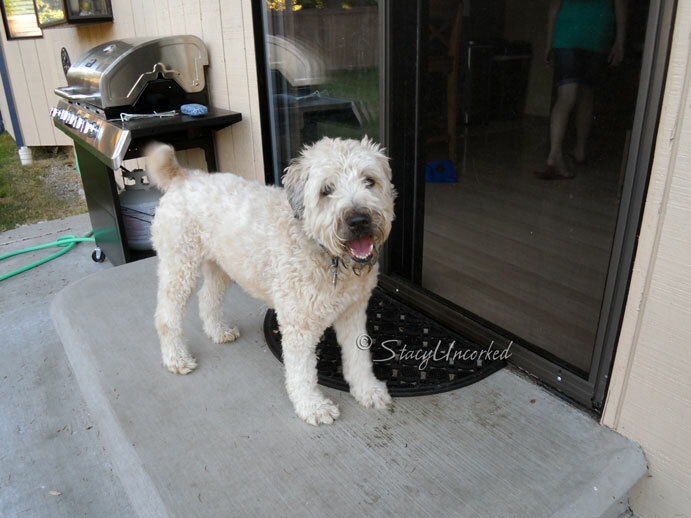 This entry was posted in Random Tuesday Thoughts Rebel and tagged cars, cats, dogs and cats, Dork Dog, family, Fun, Kids, Laughter, linky, random, Random Tuesday Thoughts Rebel, Technology by StacyUncorked. Bookmark the permalink. Yay for our PA house selling! That must be a huge relief. Lila looks adorable. Glad she is fitting in so well. Hopefully the cat fascination ends soon. Congrats on selling the house! I bet that’s exciting and it’s cool you also got to get new cars. I have about a year before I can; mine’s still in fine shape but it’s awesome to get new stuff. I find it amusing that some places in this country don’t come with central air; lol. I have been living in Florida too long, I think. Whoop, Whoop! for selling the PA house! That must be a huge relief. Nice wheels! Things settle for us and I think we may be looking for newer wheels for me. Our dogs spin out on the kitchen floor constantly. I’m surprised there aren’t dents in the cabinets where the crash sometimes. Gads! 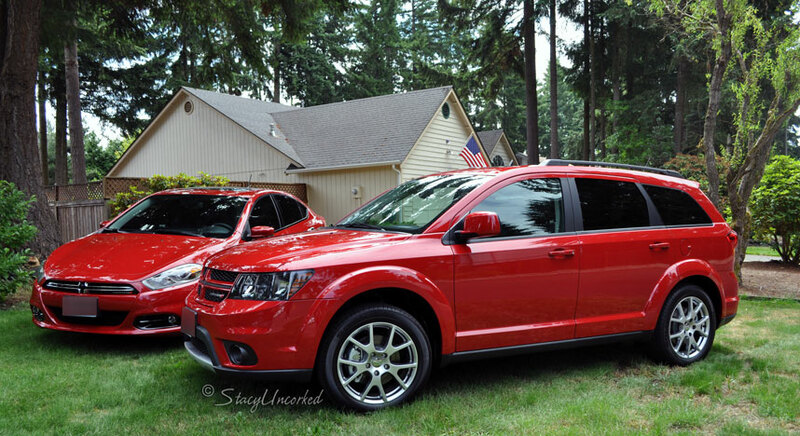 We traded in the one van with 140K miles on it and are now looking to replace the one with 78K on it…not sure our driveway will look as snazzy as yours though…especially if the salespeople keep ignoring me! Love that your pooch want to play with the cats. that’s how Fozzie is. Holy moly, how did I miss that YOU were existing with no A/C?!?!?!? !